How can you and I possibly use this leadership quote? 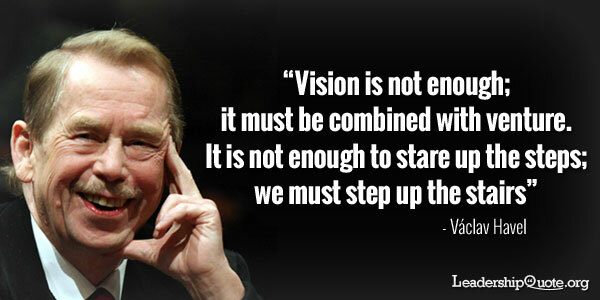 Your vision is not enough! There is a lot of talk about vision, values and personal mission statements. These alone will not help you to move in a concrete way towards your goals. I encourage you to work hard to define your personal vision. Ina any case, when you have is very clear in your mind, that is not enough. There is a big issue with achieving your vision. You may think that by writing it in big letters and putting it on your wall, you will achieve it. Yes, it will help. The process you went through to define it will have revealed much about you and your ideas. But I have seen many people with a clear vision who don’t take the action necessary to fulfil it. That way, they sit there and think of this vision and become even more frustrated than they were before they defined it! It’s no good just having a dream. You need to work on it! Nobody will achieve anything just by dreaming. Inspirational leadership quotes and principles are just that – they give you inspiration. However, you need to find a way to start putting this dream into action, moving towards your vision. Stare at the steps and see what is at the top. Dream your dream at the start of your working day. Spend a couple of minutes staring up at your vision. But you must do more than that. Make sure you have a proper action list and that every step, every action is a step upwards towards your vision. Then, start working through your action list with sharp focus. When you take that action, that step of progress towards your vision, however small the step, you will feel fulfilled. You will find yourself encouraged to seek out the next steps up the stairs towards your vision. So, dream your dream, picture your vision at the top of that stairway and then make certain that your plan is broken down into action steps. Check that each action step is in the clear direction upwards towards your vision. Then, take those steps and surely you will fulfil your vision. I do believe we’ve taken a lot out of that great leadership quote. If you enjoyed reading this post and would like more inspiration, my FREE Quote of the Week newsletter delivers weekly insights and inspiration and great leadership quotes to your inbox – simply fill in your details below. How much time is wasted in your business by people who are doing the wrong things? Could you put a number on it? I bet it’s 20%. It might even be 30%. What a horrifying thought! I work as a business trouble-shooter. When I investigate the true cost of quality, I have often come up with the 20% to 30% number. It’s extremely rare to find a business with lower than 20% waste, which I think we can agree is a very high number, can’t we? Of the hundreds of business leaders I have asked, very few have an accurate idea of the amount of error and rework which is going on in their business. When we have gathered accurate data in detail, spending the time investigating the individual errors, the truly horrific nature of the cost of quality comes out. And if one day every week across your whole business is completely wasted, that is an eye watering amount of money, isn’t it? Imagine what you could do if you had a fifth of your workforce available to work on improvements and extra projects, adding extra value every week. Do you know why the people are making these errors? It’s not because they don’t care. It’s because they don’t know what to do. And it’s your responsibility to help them learn what to do. If you are not running a big business, you are still running your own “private business” – that is, you as an individual are a business. You are responsible to yourself as CEO of your own private business. If you don’t know what to do, you are personally wasting your time and resources. Doing your best is not good enough. First you must know what to do. Otherwise you are wasting your time however hard you work. You have to learn what you must do. You must take every opportunity to find new ways of achieving what you want. Become addicted to learning. The way I learn is to read. I also listen to audio and whenever I have the chance, I listen to experts by attending speaking sessions. Then I can ask questions and learn. Find the way suits your lifestyle and your learning style. When you start to learn those things which are relevant to helping you achieve your vision, you will know that you are making real strides towards it. You will see that your hard work, doing your best, is making a big impression on your life and your success. Set down your vision. Decide what it is that you must be able to do in order to achieve it. 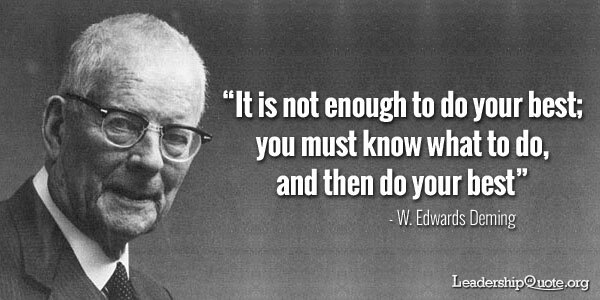 This is what Dr Deming is trying to say in this inspirational leadership quote. What of the skills you will need? What is the knowledge you must have and where will you find it? Set a plan to show yourself how you will find these things out, how you will learn them and then make it your business, as CEO, to make sure that you are not only doing your best but you are doing your best by doing the right things. They are all acting like that rocking horse! They keep doing the same thing over and over again moving like fury and yet they stay in the same place. But they look busy and anybody catching a glimpse of them in their daily work would think they are really on task. At the end of the day they’re tired. They get up the next day and they busy themselves, repeating the same things they did yesterday. Who am I talking about? The thousands of people I’ve seen in offices, factories, shops, some are working for themselves as well. This quote on leadership gives a very excellent metaphor. Most of those people are rocking horses not racehorses. How can you become a thoroughbred racehorse? The first thing is to decide on your values. Find what is the most important thing in your life. What do you value the most? That’s easy. It’s what you mostly do. If you say your family is the most valuable thing to you and yet you spend most of the time at your desk or in a bar then you value your desk or the bar more than you value family. If there is a mismatch between what you say and what you do, it’s what you do that gives you the answer. If you say you want to be the best business leader in the world but you watch four hours of TV every evening, I can tell you now that you want to watch TV, not to be the best business leader in the world. Be honest with yourself when you are looking at your values. Don’t just set dreams. Dreams are fine but you need to know what really drives you from inside. Don’t forget to include your insecurities. Many people include such things as integrity in their values. Is integrity also an insecurity for you? Deciding on your values is the most important thing you can do in life. Unless you know your values, you are destined to be a rocking horse. Well worth some deep thought. Spend some time thinking about your values. Only when you know them can you possibly set goals for your life and work out the difference for you between motion and progress. From your values, then you can determine your goals. Your goals must match your values and support them. The SMART goals process which is commonly quoted is fine in some specific circumstances when deciding on small incremental steps toward your main goal but SMART is not enough. Your life goals must be huge, not realistic in the normal sense of the word. If they are realistic, you are setting yourself up for mediocrity. 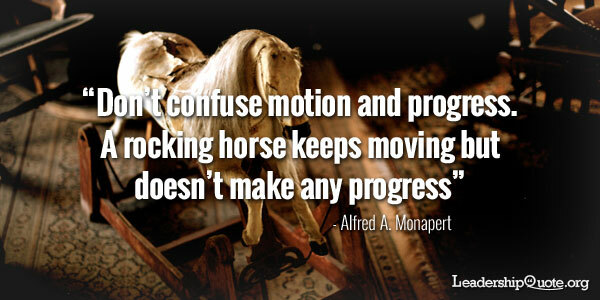 You are setting yourself up for motion rather than progress. When you have set your goals, you can start to work out where you should be spending your time. You spend your time on things which move you towards your goals which are in line with your values. Analyse where you are spending your time. There are simple tools to help you do this, mainly involving a sheet of paper and a pen. Keep a detailed time log for a week. By detailed I mean accounts each minute of each day. You don’t need to go into huge amounts of detail for each activity. Just analyse it simply by looking at each thing you’ve done and asking “Did this move me towards my goal?” Was in motion or progress? By using this simple question “Was it motion or progress?”, you can decide on every activity. You will need to be systematic in managing yourself. The simple fact is that if you ask yourself this question at each moment when you start or find yourself undertaking an activity, you will be able to decide whether you are a rocking horse or a thoroughbred racehorse.